I’ve no idea what happened to the Qatar Airways mega-sale this year. The airline hasn’t had a sale at all, yet alone a very aggressive one. I have no excuse for not knowing as I shared a lift with the Qatar Airways CEO last Friday! Other airlines aren’t standing still, so if you are looking to lock in a deal for 2019 you may be able to find something. You won’t always be able to earn Avios or BA tier points however. For no logical reason, since I doubt it was ever a major driver of traffic, a price war has broken out from Sweden to Australia and New Zealand. There are various combinations of starting point (Stockholm or Gothenburg) and destination so you’ll need to have a play around. There doesn’t seem to anything valid over Christmas and New Year but you can find offers into early December. I would start on the Singapore Airlines website as they have some interesting deals, routing partly via partners, from Stockholm to key Australian cities. You will be paying around £2,100 – £2,200. Try Cathay Pacific too. 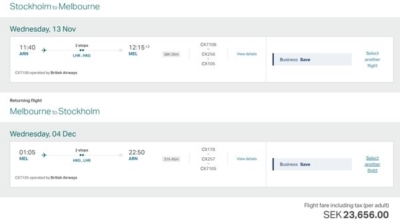 Here is a deal at SEK 23,656 (£1,995) return from Stockholm to Melbourne in late November. This flight WILL earn Avios and British Airways tier points, and is partly on BA. Cathay also has good prices to Auckland. That Etihad flight has a complex routing, however, so you will be earning your saving. The best thing to do is play around on the Etihad, Cathay Pacific and Singapore Airlines websites, and also try consolidators such as Expedia who might have private deals. It is also vital that you check exactly which aircraft types you will be on so you know you are getting a good seat. You will get a lot of miles and tier points for a trip like this too, so factor that in when comparing pricing. 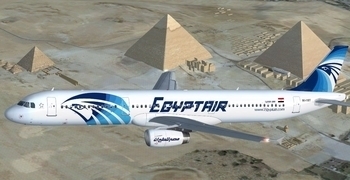 Are you willing to fly Egyptair via Cairo to get a good deal? The airline is part of Star Alliance so you will earn a decent chunk of miles if you do, and the prices are very keen. Here are some interesting business class return fares currently bookable. You need to book by the end of February and start your trip before 9th April. You can’t fly back between 15th April and 5th May. Note that Egyptair business class seating is ‘angled lie-flat’ and has a 2 x 2 x 2 configuration so it is not exactly cutting edge, but the prices certainly are. I priced it up on Expedia. If you still have a ‘£200 off £600 spend’ American Express Travel cashback deal showing on one of your Amex cards, I would try them first. The £200 cashback would take the price into silly territory. Not sure why you want to go to Amsterdam – Prices ex-LHR by EgyptAir (BKK/PEK/HKG etc.) are more or the less same, around £1000 or even less. Just booked an open jaw STO/LHR/CNS — SYD/LHR/STO on Cathay over Christmas for around £2000. Lots of availability. Amex travel haven’t got a ticketing agreement with EgyptAir. We did see the Qatar sale in January! From memory it ended 16th Jan and limited dates were available to Sydney in December from Gothenburg. We booked outbound 9th Dec and back on 29th Business class via Doha. It costed just under £1900 per person. I think only one of the legs is the Q suites though! That was just a standard promo, not the “World Travel Festival” all singing, all dancing offer. New Qatar economy seat being launched at ITB in March, apparently, with a new Business Class suite launched at ITB in 2020 (because Qsuite is so old hat now). More than happy to get the ‘standard’ promo! Still seemed to be the best option for a trip back home to Sydney during the Christmas period with a good quality airline! Anything else beating it at current apart from Air China in your most recent post? Hope not! Always on the lookout for great business class deals to Sydney as you say in previous articles – quite a pain to get a trip using miles! We have loads of points accumulated from following all your tips and have tried calling partner airlines in the past within the timelines for release of seats but never had any luck! Best to use BAPP 241 in F or J to either KUL,SIN or HKG > then use some of your miles to get to SYD on either MH,CX or QF. We used QF J from SIN to PER return which works. Thanks Polly! Interesting! It is the leg from Asia to Sydney that we struggle to book as we do often have 241 companion vouchers to use from London. Will look into this for the future for sure!